Synergy combines your desktop devices together in to one cohesive experience. It's software for sharing your mouse and keyboard between multiple computers on your desk. It works on Windows, macOS and Linux. 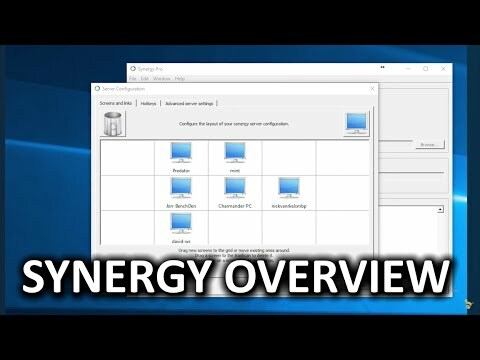 Synergy (sometimes referred to as Synergy+, Synergy Plus) was added by Shawn in Apr 2009 and the latest update was made in Jan 2019. The list of alternatives was updated Apr 2019 There is a history of all activites on Synergy in our Activity Log. It's possible to update the information on Synergy or report it as discontinued, duplicated or spam. Mouse w/o Borders makes you the captain of your computer fleet by allowing you to control up to 4 computers from a single mouse and keyboard. Alternatives to Synergy for Windows, Mac, Linux, Android, Software as a Service (SaaS) and more. Filter by license to discover only free or Open Source alternatives. This list contains a total of 11 apps similar to Synergy. Used this app for over a year and it works very well. It can have some issues (rubber banding your cursor back it original screen) but every version has made improvements to the package. Glad to hear you guys are fans of Synergy+, it's a shame original Synergy isn't being maintained any more, but hopefully when Chris turns up he'll want to merge the two projects. Oh wow, that was some time ago, and still going strong today!